Assume that you have made the choice to invest in rapid eLearning, as part of the training program initiatives in your organization. The next big question that you will face is the choice of authoring tools for rapid eLearning development. Adobe Captivate is one among the amazing tools that you can use for rapid eLearning development. The latest, 2017 release of this tool delivers an interactive learning experience. Corporate training professionals who want to rollout online courses quickly, and those who want to create software simulations and product demos, can benefit by using Captivate. While eLearning developers might have a million reasons to use Adobe Captivate, why should you as a training manager opt for this tool? Here are 5 amazing reasons to use Captivate for rapid eLearning development. Most organizations today have an increasing number of employees who like to learn on-the-go. Instead of whiling away time while commuting to work, or waiting at the airport to go on a business trip, or even after completing their work schedule for the day, they would prefer to learn at their convenience. There is also another set of employees for whom performance support is essential to excel in their job roles. For example, a salesperson on the field might need to look up the features of a new product quickly, before he steps into the client’s office for a sales pitch. This means that, the rapid eLearning courses that you rollout need to be compatible with a variety of mobile devices. Here’s how each enhancement contributes to responsive design support in rapid eLearning development. Have you ever noticed a difference in font, when you view an eLearning course on the desktop and on a smartphone? With the 2017 release of Captivate, Adobe has managed to solve this problem with Typekit font integration. Typekit is an online repository of fonts, and choosing from this font library during rapid eLearning development, ensures that fonts in your rapid eLearning course look the same across all mobile devices and platforms. Fluid Boxes divide the slide into containers that hold objects, text, and graphics. Depending on the screen size of the mobile device, these fluid boxes automatically rearrange or resize the objects for an optimal viewing experience. There are times when training managers are in a fix. They have training programs on a particular subject, but they are unable to roll it out to their mobile workforce, as these online courses are non-responsive. With Adobe Captivate’s 2017 release, all it takes is a few clicks and you can convert your non-responsive course to a responsive one. If you are wondering how to make use of the PowerPoint Presentations that were part of the classroom training programs, Captivate offers an easy way to convert those presentations into a rapid eLearning course. Once you have the PowerPoint presentation ready for conversion, you can import it in Captivate and add the required interactivities, such as learning interactions, drag and drop options, buttons, and click boxes. Learning interactions are ideal for rapid eLearning development, as programming knowledge is not required. Tabs, process circles, timelines, word search, and glossary are a few examples of learning interactions that can be added in a jiffy, to your rapid eLearning course. Rapid eLearning development requires eLearning courses to be produced in a few weeks or sometimes in a few days. With its range of inbuilt templates, quizzes, and interactive features, Captivate has given a new lease of life to rapid eLearning courses. The Assets library offers more than 75,000 assets, such as course starters, characters, games, interactions, scenarios, etc. Online courses developed earlier required graphic designers to design characters, and developers to add interactions. But, rapid eLearning development is all about a rapid process, and that means you do not have the time or the budget to invest in highly detailed graphics and programming. The assets library solves this problem by introducing a repertoire of characters, scenarios, layouts, and themes that can be chosen, depending on the subject of your training program. 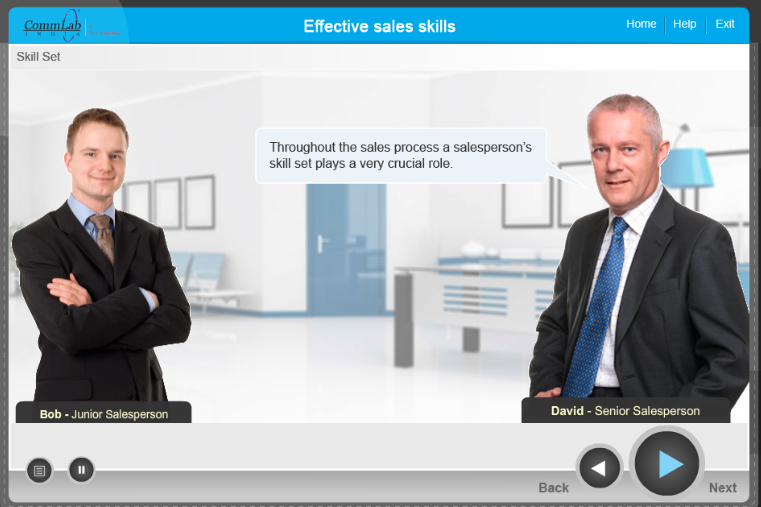 We used Adobe Captivate to a design a course on Effective Sales Skills, for one of our clients. The built-in library of real-life characters, backgrounds, and themes saved the client a lot of time, resources and money, in the eLearning course development. One of Adobe Captivate’s greatest strengths has been its support for software simulations. Software simulations are essential when you need to train employees on using a particular software application. Adobe Captivate makes it easy to create watch-try-do simulations to include in your rapid eLearning course. There are different recording modes such as demo, assessment, training, and custom. Choose this mode when you want to demonstrate a process or want to show the learner the way a software application is used. This mode lets the learners try the steps in the simulation. Based on mouse clicks, the tool can give hints so that learners perform the correct step. This mode is used when you want to test a learner’s understanding of the procedure. This is an interactive mode where feedback is displayed, based on the learner’s mouse clicks. Use this mode when you want to use a combination of features from the previous modes, in your simulation. SMEs play an important role in the rapid eLearning development process. Adobe Captivate might have a slightly higher learning curve, but if the SME is comfortable using this tool, then he/she can quickly create a simulation to be included in the online course. Consider a scenario where you need to train the sales workforce in different geographical locations. You need the team in the UK to listen to different audio clips and view different images as compared to the sales team in the US. If you have the audio clips and the content ready, you can go in for rapid eLearning development. All you need to do is use the GeoLocation feature in Adobe Captivate. Depending on the learners’ location, there will be a difference in the audio clips that they listen to, and the images that they see in the online course. You can also use the geolocation-enabled scenario and interaction templates available in the assets library. Adobe Captivate is an amazing authoring tool for rapid eLearning development. From mobile learning to software simulations, from product demos to assessments, do it all with one tool. If you have used Captivate as an authoring tool to develop your rapid eLearning course, do share your experiences. We would love to add to this list of amazing reasons to use Captivate in rapid eLearning development. Can Adobe Captivate Create Responsive Courses?